Co. Cork: Aghada (2), Ardagh, Ballyoutragh, Ballyspillane, Carrigtoohill, Clonmult, Clonpriest, Cloyne (3), Dungourney, Garryvoe, Dungan, Ightermurrogh, Imogiely, Killeagh, Kilmacdonough, Kilmahon, Lisgood, Midleton (4), Templenecarriga, Youghal (6). The Board also included 10 ex-officio Guardians, making a total of 42. The Guardians met each week at 11am on Saturday. The population falling within the Union at the 1831 census had been 73,878 with divisions ranging in size from Ballyspillane (population 1,100) to Youghal (11,327). 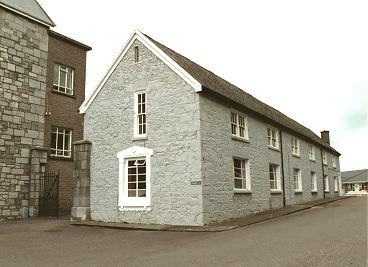 The new Union workhouse was erected in 1840-41 on a seven-acre site, the gift of Viscount Midleton, at the north of Midleton. Designed by the Poor Law Commissioners' architect George Wilkinson, the building was based on one of his standard plans to accommodate 800 inmates. Its construction cost £6,853 plus £1,347 for fittings etc. The workhouse was declared fit for the reception of paupers on 15th June 1841, and received its first admissions on the 21st August. The site location and layout are shown on the 1902 OS map below. The buildings followed Wilkinson's typical layout. An entrance and administrative block, now replaced, stood at the west. It contained a porter's room and waiting room at the centre with the Guardians' board room on the first floor above. 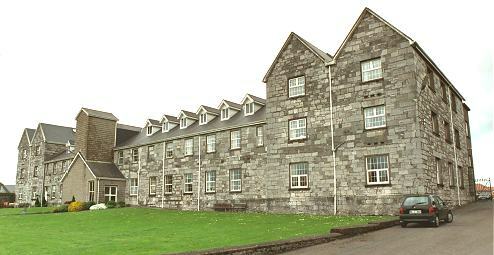 The main accommodation block had the Master's quarters at the centre, with male and female wings to each side. From the 1902 map, it appears that children's schoolrooms were located at each side of the block. The inmates' day was governed by the sounding of the workhouse bell which was located on the roof of the central spine. It was rung from via a rope which descended via a guide to the passageway below. During the famine in the mid-1840s, an extra wing was built and stables appropriated to accommodate 200 extra inmates. The new wing is probably the two-storey block which runs along the southern side of the workhouse. In April 1870, the workhouse Medical Officer, Benjamin Johnston, described the successful operation of a Turkish bath in the workhouse. I beg to report that the Turkish bath of the Middleton Union Workhouse has been in active operation for the last six years, a period sufficiently long to form a somewhat correct estimate of its merits. 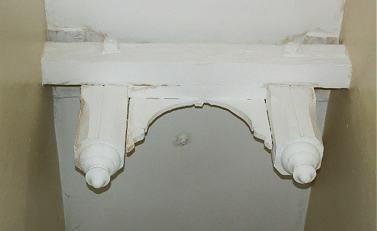 It is in almost daily use, and is pretty generally availed of by almost all classes of the inmates, of almost all ages; and although the establishment is particularly well provided with excellent and suitable lavatories for almost all classes, still we find that the Turkish bath, although in nowise superseding them, takes its proper place as a very valuable addition, applicable in many cases in which they are not, whilst it may be stated with confidence, that by no other known mode of lavement can the same absolute cleanliness be insured, whilst its value as a means of drying the clothes (and thus affording all times an ample supply of thoroughly aired clothing at an expense not exceeding that hitherto expended on fuel for a similar purpose, which answered the purpose comparatively very inefficiently) can scarcely be over-estimated, a statement in which I am fully borne out by the master and matron, who entirely coincide in my views on this part of the subject. The schoolmaster and schoolmistress also bear their ready testimony not only to the enjoyment, but beneficial effects derived from the occasional use by the school children under their charge. In fact, both young and old seem to derive both considerable enjoyment and considerable benefit from the occasional judicious use of this invigorating luxury. As regards my hospital patients; the class of cases in which I have found it most useful, were the various forms of scrofula, rheumatism, anasarca, and paralysis, in which two latter complaints, when not dependent on any organic lesion, we have occasionally obtained beneficial results; but especially in cutaneous affections of almost all forms in which its steady use has been almost uniformly crowned by a beneficial result, and with this exception, my experience does not lead me to regard it as a mode of cure (unassisted by other means) in, perhaps, any other form of disease. I am sure it would prove a valuable auxiliary in the reduction of dislocations, and also in the taxis for the reduction of strangulated hernia, and in some cases of retention of urine; but I cannot speak from experience. In fine, as in my opinion the judicious use of the Turkish bath unquestionably tends to conduce towards and promote the general healthy tone of the establishment, I cannot refrain from expressing my opinion that neither this or any other public institution can be properly mindful of the health of its inmates, or in a word, at all complete, without being provided with this very valuable addition to its other hygienic appliances. The nearby Fermoy and Lismore unions also installed Turkish baths, as did the Cork and Limerick District Lunatic Asylums. In 1937, the original entrance block was replaced by the present entrance buildings, originally known as the Cottage Hospital. Inmates at this time were still identified with the "Union grey" material used for their clothing. Nursing care at Midleton developed with the arrival of the Sisters of Mercy. The Sisters continued to run the hospital until 1994 when a lay matron was appointed by the Health Board. The site is now (2002) the home of Our Lady of Lourdes Community Hospital which provides care for the elderly. Cork City and County Archives, 33a Great William O'Brien Street, Blackpool, Cork. Holdings include: Board of Guardian Minute Books (1845-1924); Resolution Books (1896-1922); Day Books (1906-20); Indoor Relief Registers (1841-1923); Admission and Discharge Book (1925); Indoor Relief List (1917-19); Record of Births (1844-1930).